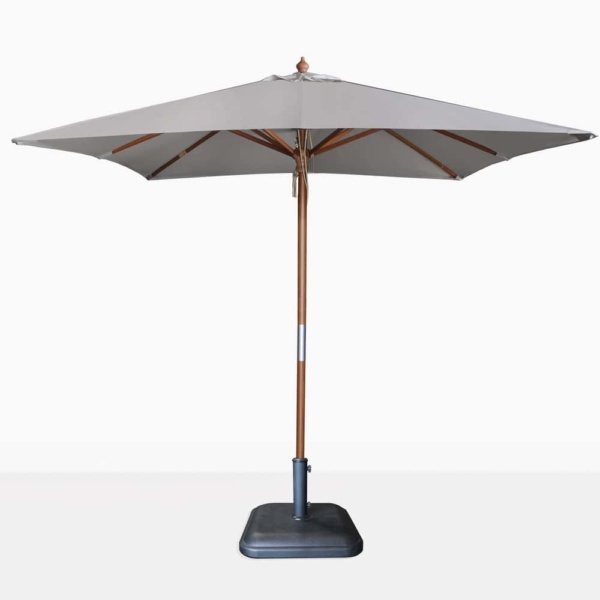 Stay cool and spend more time outdoors with the Dixon Market Olefin Square Umbrella. It’s contemporary square shape, yet classic wooden pole is the perfect design for any outdoor living space. Its warm grey canopy is classy and cool. Use it for relaxing poolside or to provide shade while dining outdoors. Lie back on your favorite sunbed and relax under the functional Dixon Umbrella. It has an easy to use pulley system that assists in opening and closing the canopy. Be sure to close the umbrella when not in use. The umbrella base shown is not included in the price. Teak Warehouse offers an amazing selection of outdoor umbrellas including cantilever umbrellas. Our experienced sales staff can assist you in selecting the perfect umbrella for your space. Please call or email us today to select an umbrella base that will work for you and your outdoor space. The Dixon Market Umbrella with Olefin is available in 2 sizes.